Alfred Hitchcock's "Psycho": Can you name the painting? Just rewatched Alfred Hitchcock's Psycho last night, so prepare for a couple of thoughts. But first, maybe you can help. 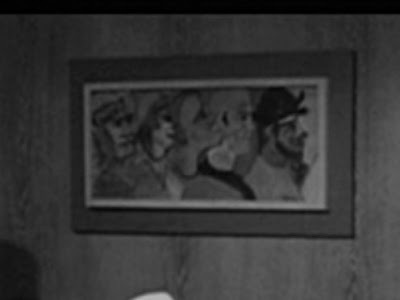 Can you identify the painting that hangs in the office of George Lowery (Vaughn Taylor), Marion Crane's (played by Janet Leigh) boss? I'm guessing it's a Picasso. BTW - I haven't forgotten about a few connections that have turned up between Vertigo and Niagara. We'll be getting to that, I promise!